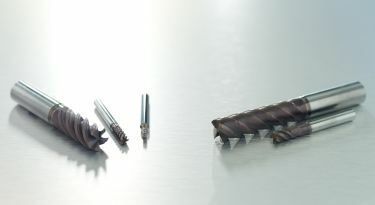 Shops that struggle to maximize end-mill tool life when machining tough materials can now achieve 25 to 40 percent longer life with new Jabro®-Solid2 JS750 end mills from Seco Tools. Designed specifically for the aerospace sector, the new JS754 and JS755 tools provide cost-effective high performance to tackle that industry's challenging materials, including ISO M (stainless steel) and S (heat-resistant superalloys and titanium). The JS754 and JS755 cutter geometries optimize conventional side milling, roughing and slotting, as well as advanced roughing and dynamic milling operations. Instead of struggling with chip formation, the smooth peripheral rake faces and strong radius design of these cutters evacuate chips efficiently while maintaining a true radius form. To avoid slow or unreliable cutting when interpolating or ramping for pocket machining, increased front back tapers enhance speed and reliability. The broad range of JS754 and JS755 variations and features ensures the highest cutting performance. Shops can match tool to application with various lengths, OD neck reduction sizes and corner radii, as well as chip splitters and through-coolant options.